After a building has been constructed, some settlement is quite normal. Differential settlement, however, is when a building’s piers or foundation settles unequally. Differential settlement can result in damage to the structure, and is therefore, of concern. Differential settlement occurs when the soil beneath the structure expands, contracts or shifts away. This can be caused by drought conditions, the root systems of maturing trees, flooding, poor drainage, frost, broken water lines, vibrations from nearby construction or poorly compacted fill soil. Differential settlement can cause cracks in a structure’s foundation and interior walls, as well as uneven settling of doors and windows. Other signs of differential settlement include tilting chimneys, exterior stairs that tilt or sink, bulging walls, leaking through openings and sunken slabs. Since soil settlement tends to be gradual, cracks due to differential settlement tend to be larger at the top, diminishing to nearly nothing at the bottom. You may also see signs of vertical movement. 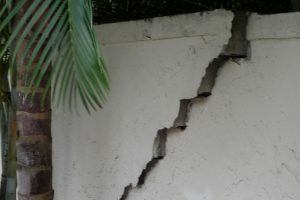 If you see signs of differential settlement, consult with a structural engineer to determine if the settlement is only causing cosmetic damage or if it will need to be addressed. If it needs to be addressed, a structural engineer will be able to determine the cause of the settlement and to make proper recommendations on how to fix the situation. Problems should be addressed early, when they are minimal. With proper engineering review, the issues can be identified and monitored or rectified. They should not be ignored, however, because, even without catastrophic failure, problems can affect the habitability of the house and result in expensive repairs. The best way to prevent differential settlement is to analyze the soil you are planning to build on, as well as the surrounding environment. In the ideal situation, the site soils will be non-expansive, meaning they have little clays or silts. Also ideally, the structure will be laid on undisturbed, native soil. An engineer can determine the load bearing capacity of the soil and estimate settlement of the planned structure. Once these calculations have been performed, make amendments to the soil before construction begins, in order to minimize differential settlement. If it is necessary to build on disturbed soil or fill, the foundation can be built on piles which extend down to good load bearing soil. In conclusion, you now know what differential settlement is, some common causes and signs, what to do if you suspect that it is an issue with your structure and the best strategies to avoid it in the first places. If you see cracks in a structure’s foundation and interior walls, uneven settling of doors or windows, bulging walls, or tilting chimneys or exterior stairs, it is best to contact a structural engineer and schedule an onsite evaluation.